I've said it before and I'll say it again, Where is the time going? 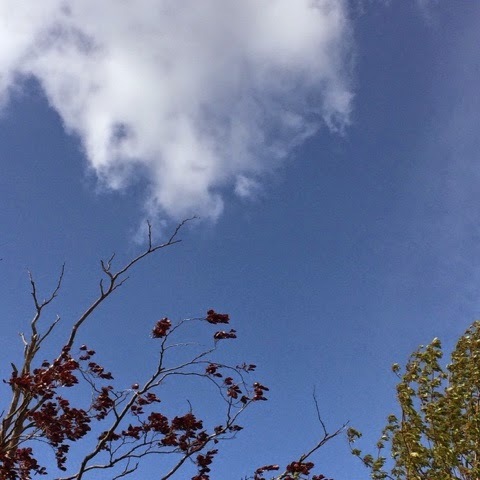 Life here seems to be coasting, drifting if you will along a current of appointments and treatments for our youngest. There's been practical changes to our work arrangements (well mainly mine as being an academic is fairly flexible) as she can't go to nursery at the moment. We've become experts in her condition, in giving her medication, in undertaking daily tests, in knowing and understanding and negotiating the subtleties of the health service. It's hard advocating for your child, making decisions on her treatment which could affect her future, it's very hard. If I had a penny for everyone who has said to me "Ooh you'd never think she was ill would you" I'd be very, very, very rich. I know (for the most part) they mean well but it doesn't really help much. Of course, it is incongruous, a very ill child who's running round and doing forward rolls. Not wanting to be left out it's looking likely that our eldest has a nut allergy. Pistachios for certain. Other nuts? Who knows but she's not having nuts anymore. More referrals. More appointments. More tests. Even with 'insider' knowledge on navigating the health system it's exhausting. But amidst this there is joy. I've laughed myself silly at Peter Kay's new comedy about a car share. i think it might be one of those that you keep coming back to. We've watched some more films - 24 Hour Party People (again), Alan Partridge - Alpha Papa (again), Silver Linings Playbook (which I loved as a book and the film was pretty good) and with the girls, Despicable Me. They are now officially minions crazy. Another upside of being home more is more time in the garden. The girls love playing in the garden , although my plants and I aren't that happy with an enthusiastic 2 year old pulling and trampling on them. 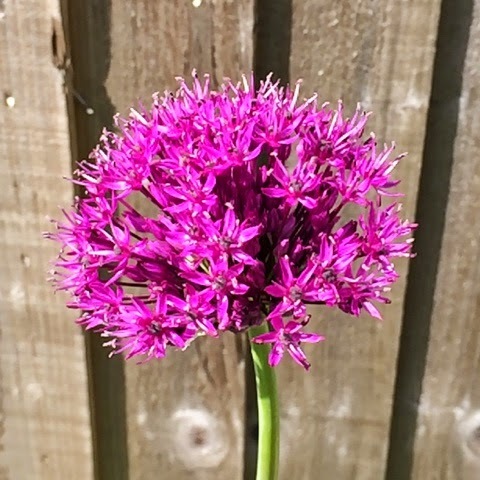 I've been growing alliums again this year and finally, finally had success. I'm very pleased with myself! 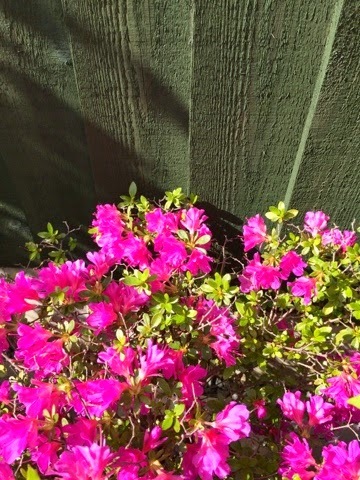 My trusty azalea has burst into flower again, It's hot pink blooms really cheer a corner of the garden. I believe the old wive's tale too (that they like being moved) and took it on its annual walk round the garden (it is in a pot, I've not lost my mind that much) before it flowered. 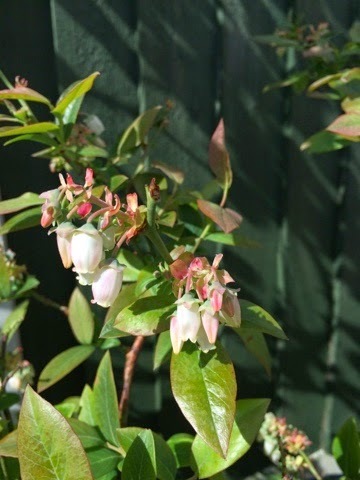 I'm looking forward to a bounty of blueberries this year. LittleR ate the best part of a punnet today! I've made a lot of new cakes but taken no pictures of them. Cherry cake, chocolate marble cake, (the offensive) pistachio cake. I thank you Mary Berry and Fay Ripley. I've been reading numerous cookery books and making a huge list of new things to try. I still haven't gotten round to buying that mug. Although I did spot an interim replacement in Asda the other day. I love a puffin. I'm reading your blogs but doing it from my phone means commenting is more challenging. I hope normal service can be resumed...eventually. Yes I can imagine that refrain about your daughter 'looking so well' could get wearing after a while. I guess if there is an upside, it's spending precious time in the garden (or anywhere really) with your children. 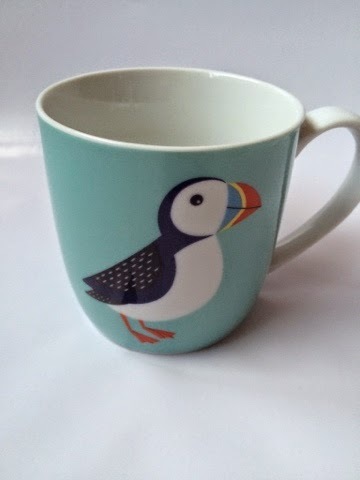 As for that mug; well Olly's class is called Puffins. I need to get my hand on three of these for his teachers! Asda online here I come! I'm playing catch-up too after our holiday and agree, commenting using a phone is very frustrating. I do hope things get easier for you. Even with all our misfortunes over the past year, I really don't think it gets any harder than having a poorly child. I'm glad you're enjoying the little things which give you some respite and pleasure. And those alliums will reward you with some beautiful seedheads later in the year! I'm another playing catch up - the new grandbaby has been the principle distraction here - and wishing you a smoother ride in future than the one you've had lately.